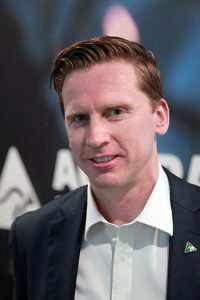 After taking over as the new Chief Executive of the Australian Made Campaign earlier this year, Ben Lazzaro said he plans to continue to grow the public profile of the Campaign and increase the benefits offered to its licensees. “We do not want to fix something that is not broken, so we will be focusing on developing additional ways we can build the reach and relevance of the Australian Made Campaign in the New Year. Our current growth is strong, with numbers increasing as far as licensees go. The Australian Made logo was also recently mandated by the Federal Government to be on nearly all food products in Australia, which in turn increases the already incredibly strong brand recognition the logo has. This has a halo effect in other sectors as well. The fact that consumers are constantly seeing the logo in the retail environment certainly has a flow-on effect in other industries, including the hardware sector,” Mr Lazzaro said. The Australian Made Campaign will continually seek ways it can add value for its licensees, according to Mr Lazzaro, who said this would include the increased marketing of Australian Made products via social media channels. “Australian Made licensees have the ability to submit scheduled posts to our social media channels in order to promote their licensed products directly to consumers. We are active on Facebook, Instagram, Twitter and LinkedIn and this amounts to a significant consumer audience our licensees can sell to. Shoppers can also opt-into an Aussie Made Club to receive regular updates on Australian Made news, competitions and giveaways. So there is a substantial focus on giving licensees assistance where we can,” he said. The online marketing channels remain free of charge to licensees because the Australian Made Campaign believes it is important to continually assist licensees in selling and promoting their products. “In-store, the logo also continues to do its job at point-of-sale, with recent research indicating the logo is 99 per cent recognised and 86 per cent trusted by Australia consumers. Therefore, when it is on a product, it delivers the ‘Australian Made’ message instantly and clearly. In combination with the online and social media channels, the logo delivers above-and-beyond what it has traditionally been used for.” Mr Lazzaro said. 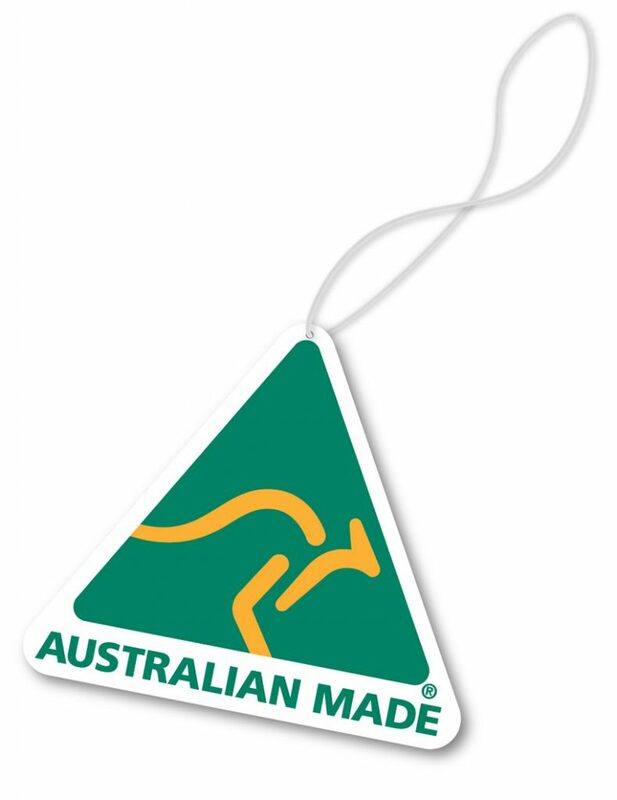 Overseas, the Australian Made logo has been effective in a number of markets including China. This can be somewhat attributed to China’s growing familiarity and appetite for genuine Australian products made to high standards in a clean green environment. Increased trade, travel and tourism between the two countries also helps build Australia’s reputation with Chinese consumers and their familiarity with the Australian Made logo, according to Mr Lazzaro. “The logo has a wonderful reputation in China and South East Asia, with research in China showing 70 per cent of consumers surveyed in Shanghai and Guangzhou said they made a connection to Australia when they saw the logo. This is remarkable for an organisation whose marketing spend is largely focussed on the domestic market,” he said. The thirst for Australian Made products in China remains high because the products are synonymous with quality and value, according to Mr Lazzaro, who said Chinese, North Americans and Middle Easterners appreciate that Australian products are made to high standards. Australian Made Campaign Chief Executive Officer, Ben Lazzaro. Consumers are becoming more discerning with their purchasing decisions. There has never been better access to product and brand information, particularly in the online space. As a result, consumers are researching prior to purchase more than ever, according to Mr Lazzaaro. “The smarter brands are telling consumers their stories about how they employ people locally and support the local community. The Australian Made logo delivers a key element of this story – it is authentically Australian and complements the brand’s own story,” Mr Lazzaro said. The Australian Made Campaign aims to help local brands tell their story to the consumer with the launch of a new initiative next year, which will see the campaign profile many local businesses, and their stories, online. “There are some wonderful Australian companies, particularly in the hardware sector, like Mumme Tools. Their facility in South Australia is a wonderful demonstration of Aussie manufacturing. The Mumme Tools team turned their business around and are now doing some amazing things in the forged tool environment. A lot of their tools have application in mining and heavy industry sectors where safety is paramount. They are a real leader in this area,” he said. “All of these companies have the option of manufacturing elsewhere at lower costs but they have chosen to manufacture here in Australia and leverage the advantages that brings. We commend those companies successfully making products in Australia, supporting the local economy and investing back into the community,” Mr Lazzaro said. Recently, changes were made to the country of origin ‘safe harbours’ in Australian Consumer Law. The changes included the removal of the 50 per cent cost of production requirement, as well as changes to the definition of ‘substantial transformation’. “Essentially, a product can now be described as ‘Made in Australia’ so long as it satisfies the ‘substantial transformation’ test, which in itself is subjective. To use a food example, you are allowed to import all of the ingredients to make a cake, mixing those ingredients and baking them into a cake here in Australia. And that is an Australian-made cake. You have substantially transformed those imported components into something fundamentally different in essential character and identity,” he said. However, business will always face the challenge of addressing what consumers think the Australian Made logo does, or should, mean, according to Mr Lazzaro. “The Australian Made statement is very different to an Australian content statement. The Australian Made licence gives consumers confidence that the end product has been made here, or substantially transformed here, and qualifies the manufacturer to make a ‘made in’ claim. The important thing to remember is that products made in Australia (whether from local or imported components) are made to some of the highest standards in the world, in a clean, green environment, whilst providing employment opportunities for Australians, local support and generating economic activity in local communities,” he said. Although recent research, in the hardware sector particularly, revealed that consumer preference for purchasing Australian Made products was at 74 per cent, there are still many boxes that need to be ticked before this actually becomes a reality, Mr Lazzaro said. “In the end it is the brand and the label’s job to tell the story to the consumer,” he said. 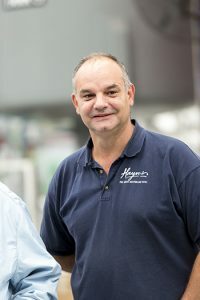 Haymes Paint, Export and New Business Manager, Matt Haymes believes there has been a significant positive shift, in recent years from retail and trade consumers, along with independent paint specialist and hardware stores, who actively want to buy or sell Australian Made and Australian owned paint products. 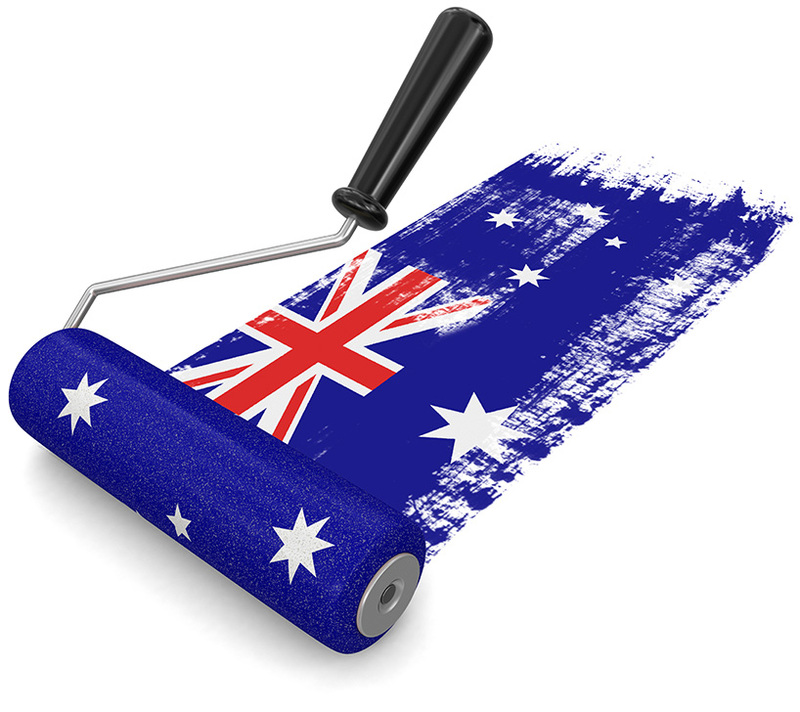 “The great majority of paint sold in the Australian market is also made in Australia. Although many of the big brands in paint have been owned by American multi-nationals for decades, the trend to support ‘local’ is currently gathering significant momentum, which is frankly bloody exciting,” Mr Haymes said. In saying this, being Australian Made and owned, continues to be a key value at Haymes, however this must be supported with best in market quality products and service, according to Mr Haymes. “People are actively changing their selling and purchasing decisions to support other local family businesses. Haymes Paint is the largest of only a handful of remaining 100 per cent Australian Made and family owned manufacturers of surface coatings. Our brand message ‘Australia’s First Family of Paint’, is a key point of difference for us,” he said. Haymes Paint, Export and New Business Manager Matt Haymes said consumers and retailers continue to actively buy and sell Australian Made products. While the Australian paint market does remain highly competitive, it seems this has been the case for many years, according to Mr Haymes. “Several new building substrates have also entered the Australian market over the past few years, providing both a threat to paint manufacturers, but some exciting opportunities as well,” Mr Haymes said. Locally the Australian paint market remains very mature, while growth in the architectural and decorative segment remains flat. “Growth for all manufacturers can only really be achieved by an increase in existing market share and winning customers from competitors,” he said. Looking into the year ahead, Mr Haymes said new product innovations continue to play a critical role for all paint manufacturers who wish to find a way to stand out in a fairly homogenous industry. It seems Australian consumers have become much more aware of the importance of supporting local manufacturers in recent years, according to RLA Group National Business Manager (Retail and Trade), Emma Greeves, who attributes the increased awareness to the recent demise of the Australian automotive industry. “The demise of this industry, particularly, has not only sparked outrage in local communities but has truly changed the way Australians think about how purchases are made. Consumers now make more conscious decisions to buy Australian Made and are not basing these decisions on price alone. There is now a better understanding of the positive economic impact that buying Australian Made can have on this beautiful country of ours,” Ms Greeves said. “We strongly believe that supplying Australian made products gives us a significant point of difference in the market, especially now that a number of our competitors are taking their manufacturing off shore. This allows us to stand out from the crowd and emphasise the benefits and importance of purchasing locally manufactured products,” she said. As the RLA Group is in the business of sealants and adhesives, quality of product remains vital, according to Ms Greeves. However, this is not always the case when it comes to imported products, she said. 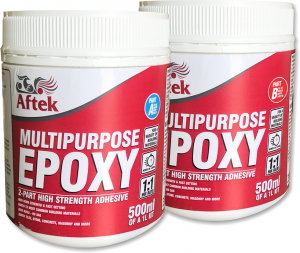 RLA Group’s new Aftek Multipurpose Epoxy Adhesive creates a permanent bond strength in just five to six hours. “A lot of products coming in from off shore are just not up to the quality and standard that our market demands. Our customers know our Australian Made products are manufactured to withstand the unique Australian climate,” Ms Greeves said. “I also believe that customers who shop at independent hardware stores have already made a conscious decision to buy local. When the opportunity presents, they would much prefer to support Australian made products ensuring jobs and profits stay in Australia,” she said. RLA Group’s sales continue to boom, according to Ms Greeves, who said the company has enjoyed significant growth across all divisions. She attributes this ongoing growth to the continual release of new products and technologies to the market, including the implementation of innovative technology to its products as well. “Our range of powdered products, including our Aftek grouts and levellers, which have seen a jump in sales, as well as our PVC solvent cements and consumables range. We believe this may be due to the quality and reputation of our products as well as our flexibility to make any job-specific changes where required,” she said. The RLA Group recently released several new products onto the market, including the recent launch of its Aftek Multipurpose Epoxy Adhesive. The two part high performance kit has non-sag, non-staining properties that create a permanent bond strength in just five to six hours. Ideal for bonding a variety of building materials, the new epoxy adhesive boasts high tensile and high compressive strength and is available in one litre, four litre and 20 litre kits. “We have also introduced an underwater grout designed for the refurbishment of piers and jetties. When applied, the product cures underwater to refurbish the piles substructure,” Ms Greeves said. Fischer Plastics’ 100 per cent Australian made and owned products, have become very well known throughout the industry, particularly for its added strength and resilience, within industrial and heavy-duty applications, as opposed to cheaper imported goods. According to the Fischer Plastics Sales and Marketing team, Fischer Plastics quality assurance and compliance in a variety of industries is a clear standout factor, not only with the recognised Fischer brand, but patented designs as well. “Fischer Plastics only uses the highest quality raw materials and works closely with our materials supplier to ensure we produce the best possible product. Our network of distributors, wholesalers, retailers and end user consumers, that have previously purchased or used Fischer products, know that they are getting a 100 per cent Australian made and owned, high quality product that will not let them down. This is why they continue to purchase our existing and new product lines,” the marketing team reported. Fischer Plastics also recently became Australian Made Certified, which has also allowed its distribution and reseller network to add point-of-sale benefits and ultimately increase business. “It seems consumers have increasingly become more concerned with the lifecycle of their products, particularly when it comes to plastics, because the strength capacities and longevity of the product are significantly improved through local manufacturing and injection moulding with higher quality materials,” the marketing team reported. 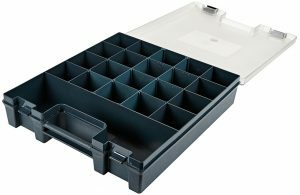 While not only producing injection moulded products, Fischer Plastics also boasts a state of the art engineering tool room, which allows its product development to span across design concepts, right through to the physical production of a product (i.e. from design concept to reality), according to the team. Fischer Plastic’s ‘Viro’ range utilises pure recycled material, while maintaining its high quality. The ‘Viro’ range has been a particularly popular range over the last 12 months. “Industrial plastics and materials handling in general is increasingly looking into new technologies, such as automation systems and improving efficiencies for inventory management. Fischer Plastics has worked with a number of key players within this space and is exploring additional coding techniques, barcode systems and storage bins to suit an automated system,” according to the team. Looking into the year ahead, Fischer Plastics has a number of new products in the pipeline for release, which includes expanding its current range, as well as exploring new areas all together.